“At the time the plaintiff’s contract was wrongfully terminated, it had completed work in the amount of $US313,831.35, no part of which had been paid, except the amount of $US194,069.08, thereby leaving a balance due and owing of $US119,762.27,” the AT Concept claim states. The building firm is hoping to recover this amount through the court action, as well as legal costs and fees. The US arm of collapsed fast food chain Pie Face could be in for a costly legal battle, with a New York-based building company initiating legal action against the company, which it alleges wrongfully terminated a contract and failed to pay bills of up to $US360,000 ($A425,129). Building company AT Concept has launched a claim against the Pie Face store near Hell’s Kitchen as well as parent company Pie Face Holdings in the Supreme Court of the State of New York, according to News Corp. 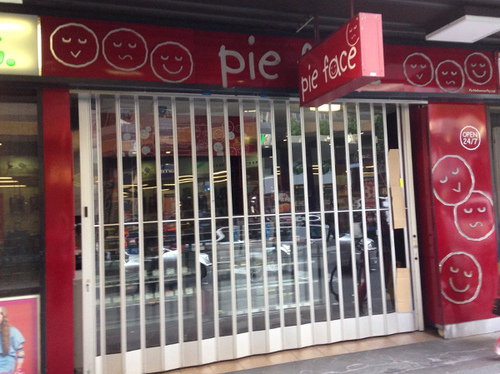 In its claim, AT Concept said it was engaged by Pie Face Holdings to construct the store in 2013 for an agreed price of $US303,560, with the bills for the project later climbing to $US360,000 due to new demands from Pie Face management. But AT Concept alleges Pie Face breached its contract by failing to pay for the completed work and later terminating the contract. “At the time the plaintiff’s contract was wrongfully terminated, it had completed work in the amount of $US313,831.35, no part of which had been paid, except the amount of $US194,069.08, thereby leaving a balance due and owing of $US119,762.27,” the AT Concept claim states. The building firm is hoping to recover this amount through the court action, as well as legal costs and fees. According to News Corp, Pie Face has denied the claims. Jirsch Sutherland, the administrators of the Australian Pie Face business, declined to comment when contacted by SmartCompany this morning. The lawsuit follows the quiet closure of six out of seven Pie Face stores in New York City in October, just weeks before the Australian business plunged into administration. Administrator Sule Arnautovic of Jirsch Sutherland told SmartCompany on Friday that 20 Pie Face stores have closed as part of the voluntary administration process, with 130 part-time employees losing their jobs. A meeting of Pie Face franchisees, management and administrators is expected to take place this week, while a meeting of creditors is scheduled for Wednesday. Macquarie has emerged as the one of the troubled chain’s secured creditors and last week appointed Ferrier Hodgson partners Steve Sherman and Peter Gothard as receivers to a number of key Pie Face assets. A spokesperson for Ferrier Hodgson told SmartCompany this morning Sherman and Gothard have been appointed as receivers for “cash at bank as well as shares held in Pie Face Inc, as well as director loan accounts” in Pie Face Holdings. However, the spokesperson says Ferrier Hodgson will not have any involvement in determining if a Deed of Company Arrangement will be presented to Pie Face creditors. “This is a matter for the voluntary administrators and creditors generally,” the spokesperson says. Fairfax reports Ferrier Hodgson has been appointed as receivers to control the agreement between Pie Face and high-profile US casino developer Steve Wynn, who made a $15 million investment in Pie Face’s US operations in 2012. SmartCompany has contacted Wynn but is yet to receive a response and has been unable to contact AT Concept.